Sudha cupped Naina’s face:Our Neenu looks more prettier now. Sudha:I can’t wait you to be my daughter in law. Madan:But she is already our daughter. Sudha:Right.I have always considered Neenu as my daughter.That’s why I chose her for my Veer. Naina gave a pale smile. Sudha gave her a lehenga:Wear this for today’s engagement function. Naina and Veer were shocked. Veer :Means in few hours Naina and I will get engaged.So fast. Jas:Yes.We have decided to conduct the engagement function in the evening. Madan:Life is fast beta.So the engagement has to be fast.Right? Juhi:Are you guys getting impatient about the engagement? Jas:Don’t worry.Within a few hours you guys will be engaged. Veer:I want to tell you all something. Naina thought:I think Veer will tell the truth and cancel the engagement. Sudha:Not now beta.We have to do a lot of arrangement for the function. The parents went for arrangements. Naina:Veer…what will we do now? Veer:Don’t get tensed Naina.We will do something. Veer was in his room. He extended his hand to touch her romantically. Veer:Damn it.It was my illusion. Sudha:My son looks so handsome now.You look like a Prince.Naina will love you more now. Veer said emotionally:Not Naina mom…Sakshi..only Sakshi can love me.No one can love me more than Sakshi. Sudha was stunned:What are you saying Veer? Veer was upset:I don’t want to do this engagement with Naina.I will put the ring only on Sakshi’s finger.I love Sakshi. Sudha was shocked:You love Sakshi?Then why did’nt you tell us before?You were happy when we fixed your marriage with Naina. Veer:I am sorry mom.Your son is a duffer who did’nt realize his love.I became late in realizing my love for Sakshi. Sakshi:Tell me clearly.Are you sure that you love Sakshi?Don’t get confused now. Madan came there hearing this with a shock. Madan:What is this?What will I tell Jas,Juhi and Naina now? Sudha:But Veer can’t accept Naina keeping Sakshi in his mind.Right? Veer:Naina won’t have any problem.I already told her that I love Sakshi.She is only happy. Sudha and Madan are relieved. Madan:We just have to convince Jas now. Ishani:Naina…atleast now you should tell your parents. Juhi:What does Naina want to tell us? Juhi:Tell us Naina.What is bothering you? Ishani:I will say.Naina loves her classmate Shikar,not Veer. Jas and Juhi got shocked. Jas:Then why did you hide it Naina?Were we not your friends more than parents? Ishani:Naina did’nt want to make you both upset.She knew that uncle owes to Veer’s father.So if she does’nt marry Veer it will hurt you.So Naina even lied to Shikar that she does’nt love him. Jas and Juhi became upset. Jas:You made me so small Naina.You have grown big. Jas and Juhi hugged Naina.All were in tears.Ishani’s eyes became wet seeing it. 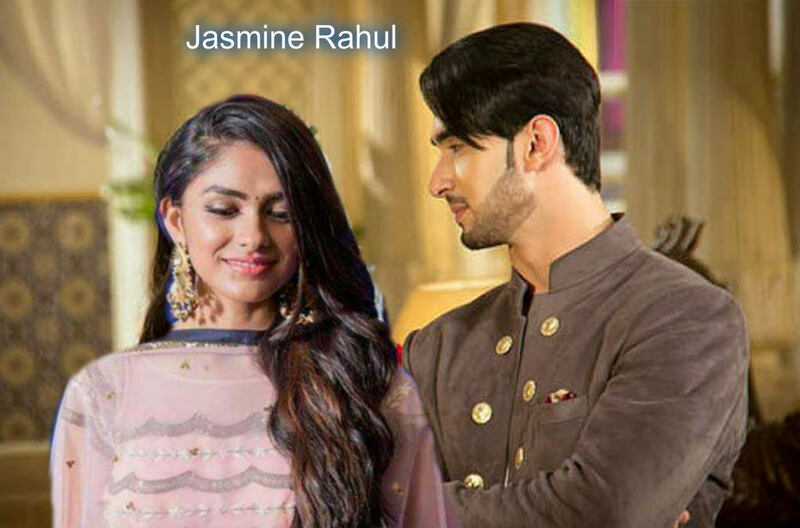 Jas:I have decided one thing.I will talk to Madan about cancelling the engagement function. Naina was tensed:But Madan uncle and Sudha aunty won’t be upset?Will they get angry? Jas:No Naina.Don’t worry about that.Madan’s friendship is not so weak to break it just because of this.So be happy. Veer and Naina reached the hall accompanied by their parents. Veer and Naina were stunned to see Ranveer,Sanjana,Samir,Neil,Tara and Avni there. Sanjana:Your parents invited us Naina. Sanjana:I thought you won’t do this engagement as I felt that you have feelings for Shikar. Samir:Shikar did’nt come.Though he seems to be bold,he is not strong enough to see you getting engaged to Veer. Ranveer:Ishani..what is this?How can Naina get engaged to Veer? Ishani:It’s her circumstance.But relax.Veer and Naina won’t get engaged. Ishani:Jas uncle and Juhi aunty came to know about Naina and Shikar.So they have decided to stop the engagement. Madan Sudha and Jas Juhi were finding it difficult to face each other. Madan:Jas…I want to tell you something.Please don’t misunderstand me. Jas:I also want to tell you something.Please don’t break our friendship. Madan:What are you saying Jas?Why should I break our friendship? Jas:Madan…please listen to what I have to say.It’s really important. Madan:You listen to what I say. Both said together:Let’s cancel this engagement. Both were stunned.Sudha and Juhi looked at each other in shock. Jas:But why did you say that? Madan:Why do you want to cancel this engagement? Jas:Why you said like that? Madan:Because Veer loves someone else. Jas and Juhi were relieved. Madan and Sudha were surprised. Sudha:Hey…don’t say sorry.We should be happy that by cancelling this engagement we are not hurting either Naina or Veer.Both are happier now. Juhi:Yes.Now Veer and Naina can find happiness in their true love. They all were very happy and they hugged Veer and Naina who were very happy. Juhi:Don’t waste time.Go and tell Shikar that you love him. Jas:Yes go Naina.Poor guy must be shattered now. Sudha:Veer…at least now be brave and confess to Sakshi that you will get engaged only to her,not anyone else. Madan:Yes ..don’t waste time.You go. Veer ran out.He was stunned to see Sakshi there in a beautiful lehenga. Sakshi:You did’nt expect me here.Right?I came to know that your engagement function is going on.That’s why I came here.But not to attend it,but to break it. Sakshi:Yes.You know why I am wearing a party wear?Because now I am the one who is going to get engaged to you,not Naina.I will make you wear the ring on my finger. Veer smiled:You are right Sakshi.It’s you who are going to get engaged to me today.Not Naina.But for that you don’t need to do any drama my obsessed girl friend. Sakshi was confused.Veer told her everything.She was surprised. Veer:I love you Sakshi.Will you get engaged to me? Veer took Sakshi inside.Sudha and Madan blessed her.Sudha gave the ring to Veer:Veer…this I bought for my daughter in law.Make Sakshi wear it. Veer slipped the ring onto Sakshi’s finger.They smiled. Shikar was in the college compound sitting. Seeing Shikar she smiled.She walked towards him. Shikar:Why are you always an illusion Naina?Why are you coming in my dreams always? N:Naina is not an illusion or dream.Naina is a reality.I am here before you. Shikar:But now it’s your engagement.Right? N:I left the engagement function for you. N:I came here to tell you an important thing. Shi:What important thing you have to say other than you hate me or you don’t love me. N:I want to say that i love you Shikar. Shikar’s happiness had no bounds. Shi:I knew that you love me and you will come to me.Because I could feel your love even when you said I hate you to me. N:I am sorry for hurting you a lot by blasting at you always with my lie that I don’t love you. Shi:It’s ok Naina.The pain you gave me is nothing compared to the happiness you gave me now. They had a romantic embrace. Ho jindagee kaa gujaara sanam(Tere naam). Neil looked at Avni deeply:Avni..in Naina and Veer’s engagement tension,I could’nt tell you one thing. Neil:That you look very gorgeous in this dress. Neil:I thought when I give you compliment,you will give me compliment back. Avni:What?Did you give me compliment only to get a compliment? Neil:Yes.If not why should I say that you look gorgeous? Avni frowned:It’s better to stay away from you. She tried to go away.But Neil pulled her closer passionayely. He looked at her eyes deeply:How can i let you go?I want you to stay with me for 24 hours. Neil:Can anyone be more beautiful than my Avni in my eyes? They shared a romantic eye lock and got into a passionate embrace. Ae Dil Hai Mushkil(Ae dil hai mushkil). Sanjana was walking.Her foot slipped.But Sameera caught her by her shoulders. Samir:You wore saree for the function? Sanj:Ya..I thought for a difference I will wear my mother’s saree.Is’nt it good? Samir gave a serious look. Then he smiled:First time I am seeing you in saree.So I was quite surprised.You look ravishing in saree. They smiled at each other sweetly with romance. Armaano mein rawaniyan pehli dafa..
Pyaar ko pehchana ehsaas hai yeh naya..
Jo dil pe nasha hai..
Tara dreamt of dancing with Naksh. She broke her dream and became shy. She thought:How could I dream of having a romantic dance with Naksh? Ranveer to Ishani:Shikar’s message came in my phone.Shikar and Naina have become a couple now. Ishani:So Naina confessed her love.That’s so sweet. Ranveer:Yes.Shikar has sent us their selfie of that precious moment. Ranveer showed her the pic. Ranveer:I am so happy that true love won.So Naina is with Shikar and Veer is with Sakshi. I can’t wait for our union. Ishani:But we are already together. Ran:But I am waiting for our wedding Ishani..the moment you get attached to my name. Ishani blushed:I am also longing for that moment Ranveer.But now our hearts are attached to each others. Ran:Yes..our hearts are already one. Ishani:You love gives me confidence.Now I feel that I will live long and we will live happily in old age too. Ranveer smiled:Yes,we will pamper our grandchildren together. Suddenly Ishani’s head started paining. Ishani fainted in Ranveer’s arms.She was unconscious.All were shocked. Falguni cried:Ishani beta…why are you not opening your eyes. Ranveer wept:Ishani…just now we said that we will be together in old age too.For that you have to get up.Get up Ishani. Jas:Let us take her to the hospital. They rushed to the hospital with Ishani. Dr:Ishani is fine now.She will regain consciousness soon. Dr:Sorry to say that her condition is getting worse. Juhi held Falguni:Falguni…please control yourself.Nothing will happen to Ishani. Dr:We tried our best.But I feel the best treatment can be given only in abroad. Jas:Don’t worry about that.Ishani is like our daughter.I will give her the best treatment.I will send her abroad for treatment. Falguni folded her hands before Jas to thank him. Ranveer:Ishani won’t be alone.I will go with her to any place.I will never leave her alone…even for one moment. Ishani gained consciousness.Ranveer sat near her. Ishani embraced Ranveer crying:Ranveer..I got scared. Ranveer cupped her face in his hands:Don’t be scared Ishani.Nothing happened to you.And Jas uncle is arranging the best doctors and best treatment for you in the US. Ishani was shocked:Treatment in the US? Ran:Yes,so you are leaving for the US soon. Ran:And I will be accompanying you. Ran:Yes..can i ever leave you alone?I will always hold your hand.Because you are my life and love.I can’t live without you. Ish:Even I can’t live without you Ranveer.I can’t be away from you. They shared an emotional romantic eye lock. Meri Aashiqui Ab Tum Hi Ho(Aashiqui2). Falguni packed Ishani’s luggage.Ishani was in tears. Ranveer:Don’t worry Ishani.I am with you.Right?When you are with me,nothing will happen to you.I promise. She embraced him crying.Ranveer controlled his tears. Falguni became emotional seeing it. Falguni,Ranveer,Ishani were in the airport.Kailash,Amba,Jas,Juhi,Naina,Shikar,Sanjana,Samir,Neil,Avni,Tara were also there to see off them. Amba:You will come back cured. Kailash:We are praying a lot. Amba:Ranveer…take care of my daughter in law. Naina and Sanjana hugged Ishani:Take care baby. They all bid good bye to Ranveer,Ishani and Falguni emotionally. Ranveer,Ishani and Falguni left for the US by flight. Wow really amazing loved veer realisation and shikar naina confession I loved the way u edited bulbul picture with veer miss her a lot..
Ishveer scenes were so emotional and sweet sameer sanjana scenes were good and avniel too I loved theway you’ve brought all the characters in the most unique way and pictures were equally good loved it??? ?